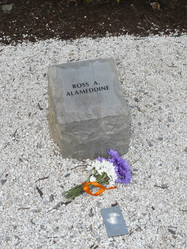 Hokie stone and flowers for April 16 victim Ross A. Alameddine at the memorial on the drillfield. Photo taken February 14, 2008. Jerusalem ----April 21...... "Daddy, tell me the story again," said the 6-year-old girl. "Tell me how he saved the big children."